Single Phase Dura Press, featureS an electric power unit, lever control ram advance, a double-acting cylinder, and one hand ram positioning. Full-service automotive mechanical department staffed by experienced technicians. ASE-certified technicians provide total car care through the use of state-of-the-art equipment and premium parts. 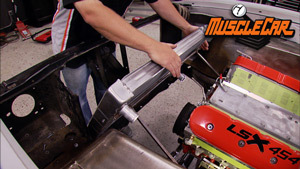 (ANNOUNCER)>> TODAY ON MUSCLE CAR, HOW CONFIDENT ARE YOU IN YOUR WRENCHING. 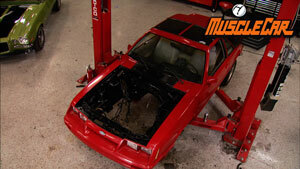 WE'VE GOT A TRANSMISSION REBUILD FOR YOU THAT WOULD CHALLENGE ANY SERIOUS GEAR HEAD. 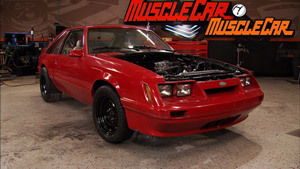 PLUS WE TUNE OUR FOX BODY AND TAKE IT FOR A RIDE, AND RUN INTO A LITTLE BIT OF TRACK TROUBLE. 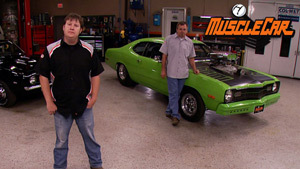 MUSCLE CAR STARTS NOW! 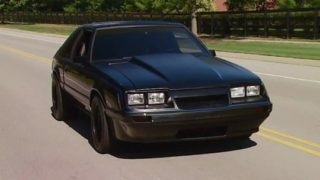 (TOMMY)>> OUR FOX BODY MUSTANG DARK HORSE STARTED LIFE AS A SIX CYLINDER CLUNKER FROM A USED CAR LOT. WE PULLED OUT THE STOCK VSIX AND INSTALLED A TUBULAR KMEMBER ALONG WITH NEW COIL OVER SUSPENSION. WITH A REBUILT POS UNIT, A NEW CRATE VEIGHT, EXHAUST, A STIFFENED SUBFRAME AND LIGHTENED INTERIOR, WE BURNED IN THE CAGE AND GOT AFTER THE BODY WORK. THEN WE HOSED IT DOWN WITH A TWO TONE DARK GREY AND FLAT BLACK PAINT SCHEME. (RICK)>> WELL WE GOT THINGS MOSTLY BUTTONED UP AND FIGURED WE'D TAKE IT OUT FOR A SPIN, SEE HOW SHE RUNS. YEAH, THINGS DIDN'T GO SO WELL. CAN ALSO BE A GAMBLE. SNAKE EYES, BUT WE DO STILL HAVE OPTIONS. ONE OF THEM IS TO REBUILD OUR TFIVE. WITH A DIFFERENT RATIO. IT'S GONNA WORK A LITTLE BIT BETTER WITH THE SHORTER GEARS THAT WE PUT IN THE REAR END. AND CHECK THIS OUT, SOLID BILLET KEYS. NOW THESE LITTLE GUYS MAY NOT LOOK LIKE MUCH, BUT THE FACTORY ONES ARE HOLLOW AND GET MASHED UP AND HANG UP ON YOU WHEN YOU'RE BANGING GEARS. (TOMMY)>> BEFORE WE CAN THROW ALL THOSE GOODIES IN IT, WE'VE GOT TO GET THIS THING TORE APART AND SEE IF WE CAN DIAGNOSE ITS ILLNESS. WITH THE LIGHT IN IT I SEE BAD THINGS, OHH, FEEL BAD THINGS. YOU AIN'T SUPPOSED TO HAVE THAT KIND OF STUFF IN IT. I GUESS WE FOUND OUT WHY IT'S MAKING NOISE. AH, MISSED! WELL WE TOOK IT OUT BECAUSE WE KNEW IT WAS BROKE. I GUESS WE NEED TO GET IT APART AND SEE HOW BAD IT REALLY IS. I'LL START BY KNOCKING OUT THE ROLL PIN THAT HOLDS THE SHIFTER OFFSET LEVER. THEN I CAN START PULLING THE BOLTS TO KNOCK OFF THE EXTENSION HOUSING. THE NEXT THING I WANT TO REMOVE ARE THE FASTENERS THAT HOLD DOWN THE CASE COVER. DRIVE BEARING RETAINER. SEE THOSE? YOU DON'T WANT TO DROP THOSE IN THERE. WITH THE INPUT SHAFT OUT OF THE BOX, IT'S NOT LONG BEFORE I'VE GOT THE OUTPUT SHAFT OUT AND THE BEARING PULLER WILL FREE UP THE COUNTER SHAFT. THAT'S HER, SHE'S BROKE DOWN. TEAR DOWN WASN'T ALL THAT BAD, BUT LOOKING ON THE INSIDE IT'S PRETTY TERRIBLE. YOU WANT TO MAKE SURE TO GET ALL THESE METAL SHAVINGS OUT OF IT BECAUSE OTHERWISE THIS REBUILD IS USELESS. (ANNOUNCER)>> COMING UP, TOMMY CONNECTS THE OVER DRIVE BONE TO THE SHIFTER BONE AS HE PUTS PARTS BACK IN OUR TFIVE. PLUS A FEW TID BITS ON PASSING EMISSIONS TESTS. IT'S BACK TO THE PRESS. I'LL USE A COUPLE OF PIECES OF ALUMINUM STOCK TO KEEP THE LOAD OFF OF OUR BOTTOM BEARING WHILE WE PRESS ON THE TOP ONE. SHAFT BEING ABLE TO MOVE IN BOTH DIRECTIONS. I'LL USE SOME ANTISEIZE SINCE WE'VE GOT AN ALUMINUM HOUSING AND STEEL BOLTS. THEN BUTTON IT UP NICE AND TIGHT. A LITTLE MORE SEALER AND THE TAIL HOUSING CAN GO ON. I'LL FASTEN IT DOWN, TORQUE IT TO SPEC. THEN I'LL KNOCK ON THE SHIFTER LEVER. ONE OF THE LAST STEPS THAT WE HAVE TO DO IS TO MEASURE THE END PLAY. WHAT THIS IS IS THE AMOUNT OF MOVEMENT THE MAIN SHAFT HAS FRONT TO REAR. WHAT WE'RE LOOKING FOR IS ZERO. SO WE'RE USING A DIAL INDICATOR TO SEE WHAT WE HAVE. THE FIRST THING YOU WANT TO DO IS SHOVE THE MAIN SHAFT FORWARD. RETAINER TO PUT IT AT ZERO. ZERO, AND THAT'S WHAT WE'RE LOOKING FOR. 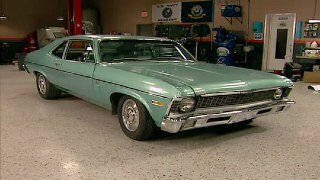 NOW REBUILDING A TRANSMISSION MAY NOT BE FOR EVERYBODY, BUT THEY'RE NOT NEAR AS MYSTICAL AS PEOPLE MAKE THEM OUT TO BE. HANDS, YOU MIGHT TRY REBUILDING ONE. I'M ALL DONE HERE EXCEPT FOR CLEANING UP. Y'ALL GO FIND RICK, HE'S GOT SOMETHING HE NEEDS TO SHOW YOU. (ANNOUNCER)>> STILL AHEAD, TUNING FOR A CLEAN BILL OF EMISSIONS HEALTH. PLUS SHE'S NOT DARK ENOUGH. MORE DARKNESS, HOW ABOUT SOME WINDOW TINT? YEAH, THAT'S THE TICKET! (RICK)>> HEY GUYS, WHILE TOMMY'S BEEN FRESHENING UP OUR TFIVE, I'VE BEEN THRASHING GETTING THE INTERIOR ON OUR MUSTANG HERE CLEANED UP. WITH TIME AND A WHOLE BUNCH OF DUPLICOLOR, ALONG WITH SOME CARPET, DARK HORSE HERE, SHE AIN'T LOOKIN' HALF BAD. BUT WE FIGURED AS LONG AS WE'RE GOING WITH THE WHOLE DARK COLORS MOTIF, WE MIGHT AS WELL FINISH OUT THE LOOK AND TINT THE WINDOWS. NOW A BAD TINT JOB CAN MAKE THE BEST CAR LOOK HORRIBLE. SO WE CALLED THE BEST, CJ AND MICHELLE OVER HERE AT SOLAR SOLUTIONS WINDOW TINT IN FRANKLIN, TENNESSEE. (CJ)>> HOW ARE YOU RICK? (RICK)>> HOW YOU DOING GUYS? (RICK)>> SO WHAT'S THE PLAN TODAY? (CJ)>> WE'RE GONNA BLACK OUT THE WINDOWS. WE'RE GONNA MAKE DARK HORSE DARKER THAN EVER BEFORE. 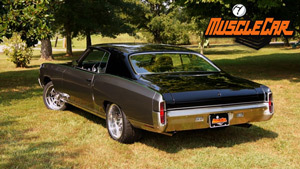 GET THE WINDOW CLEAN AND SPOTLESS IS THE KEY TO HAVING A CLEAN WINDOW TINT JOB. I ACTUALLY CUT THE FILM ABOUT AN EIGHTH OF AN INCH BIGGER, LET IT HANG DOWN THE BOTTOM. ONCE YOU SLIDE IT, HAVE IT OVERLAP A LITTLE HERE AND A LITTLE THERE, YOU CUT THE OTHER SIDE OF THE TOP. THESE GASKETS AND FRAMES. YOU WON'T SEE ANY LIGHT GAPS ON THE INSIDE. (MICHELLE)>> I'M SHRINKING THE FILM TO CONTOUR TO THE BACK GLASS. IF YOU DO IT TOO FAST, YOU'LL CAUSE CREASES IN THE GLASS OR IN THE FILM ITSELF. IT TAKES A LITTLE BIT OF TIME AND EVERYTHING TURNS OUT PERFECT. (CJ)>> ALRIGHT, GO ACROSS THE TOP, I THINK YOU'VE GOT IT ALL THERE. (RICK)>> MICHELLE'S GOT ONE LAST ROUND OF CLEANING TO MAKE SURE THAT THE WINDOW WILL HAVE GOOD ADHESION TO THE FILM. AND ONCE IT'S READY, THEY'LL POP IT ON, WET IT DOWN, SQUEEGEE THE WATER OFF, AND USE SOME HEAT TO SMOOTH IT OUT. THEN THE FILM'S READY TO BE APPLIED TO THE GLASS. THE TTOPS HAVE SOME REALLY BAD OLD TINT ON THEM. THE BEST WAY TO GET IT OFF IS WITH STEAM AND A RAZOR BLADE. OH MAN, CJ, YOU DID IT AGAIN BROTHER. ADDED THE DARK TO THE DARK HORSE. (CJ)>> GLAD I COULD HELP YOU OUT MAN. (RICK)>> SWEET JOB MAN, LET ME SEE YOU OUT. 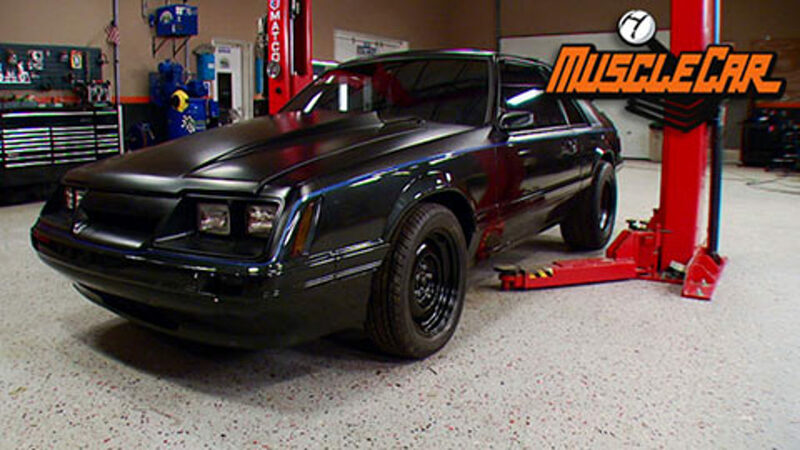 (TOMMY)>> FROM DAY ONE THAT WE STARTED THIS BUILD WE WANTED OUR MUSTANG TO BE STREETABLE. WELL A LOT OF PLACES REQUIRED AN EMISSIONS TEST. PROBLEM IS MOST COUNTY AND STATE FACILITIES ONLY TELL YOU IF YOU PASS OR FAIL. WELL THIS IS CLIFF, AND HE'S GONNA HOOK OLE DARK HORSE UP TO THE FIVE GAS ANALYZER. YOU READY TO GIVE IT A SHOT AND SEE IF SHE'LL PASS? (CLIFF)>> YEAH, LETS HOOK IT UP. (TOMMY)>> CLIFF IS THE MAN TO TALK TO ABOUT EMISSIONS AT EXPRESS OIL CHANGE IN MURFREESBORO, TENNESSEE. A LOT OF THE TIME PLACES LIKE THIS CAN COVER A LOT OF GROUND WHEN IT COMES TO GETTING STUFF TAKEN CARE OF ON YOUR CAR. THESE GUYS HAVE THE EQUIPMENT TO TEST OUR EMISSIONS AND SEE IF WE'LL MAKE IT PAST OUR LOCAL GOVERNMENT TESTING FACILITY. IF YOU DON'T MAKE IT, THERE'S SOME TWEAKS YOU CAN DO TO CLEAN UP YOUR ACT. 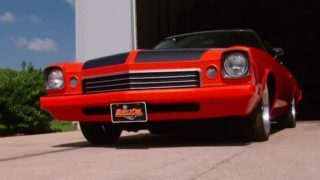 (CLIFF)>> THE HC SHOULD BE ROUGHLY 220 PARTS PER MILLION AND THIS CAR'S SHOWING ABOUT 169 PARTS PER MILLION. THE CO TWO'S ARE ZERO POINT TWOFOUR. THEY WOULD PASS. (TOMMY)>> WELL WE PASS OR FAIL? (TOMMY)>> WE DID PASS. WELL LETS JUST SAY IF WE DIDN'T PASS, WHAT'S THE MOST COMMON FIXES FOR ONE IF YOU DIDN'T PASS. 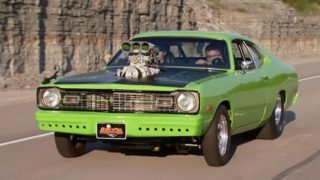 (CLIFF)>> ON A CARBURETED CAR, MAYBE A SMALLER CARBURETOR OR POSSIBLY JETTING IT DOWN. IN AN OLDER CAT, IF YOU'VE GOT AN OLDER CATALYTIC CONVERTER, LETS SAY YOU'VE GOT 200,000 MILES ON YOUR CAR, YOU GET IT GOOD AND HOT, IT'LL PASS. WORN RINGS, WORN ENGINES, YOU ALWAYS WANT A WORN ENGINE TO BE HOT. IF IT'S BURNING A LOT OF OIL IT WILL NOT PASS. THEY'LL FLAG YOU ON THE LANE IF YOU'VE GOT BLUE SMOKE COMING OUT THE TAIL PIPES. A CAR YOU CAN'T DRIVE. WELL MAN I APPRECIATE YOUR TIME. WE'RE GONNA GO FURTHER. (ANNOUNCER)>> STICK AROUND, DARK HORSE GOES FOR A DRIVE, BUT THEY CAN'T ALWAYS GO PERFECT. (RICK)>> OLE DARK HORSE IS READY. SHE LOOKS MEAN. SHE SOUNDS MEAN. SHE IS MEAN! THIS SUCKER PULLS PRETTY DANG GOOD. THAT'S FUN DRIVING STUFF LIKE THIS THAT'S KINDA BARE BONES. IT BRINGS ME BACK TO MY YOUTH. IT BRINGS ME BACK TO HIGH SCHOOL, YOU KNOW? A LITTLE ROUGH AROUND THE EDGES, BUT STUFF LIKE THIS, THAT'S WHAT MAKES IT COOL. IT AIN'T ALL SPIT SHINE. IT SEEMS LIKE THE MOTOR'S RUNNING REAL GOOD. KINDA TAKING IT EASY TO BREAK IT IN, BUT THE MOTOR SEEMS LIKE IT'S RUNNING GREAT. THE TRANSMISSION IS SHIFTING REAL NICE. YOU DON'T SOUND LIKE A LEXUS GOING DOWN THE ROAD. LAWRENCEBURG, TENNESSEE, DO A FEW SHAKE DOWN RUNS. NOW WHEN YOU'RE AT THE TRACK, SAFETY IS PRIORITY NUMBER ONE. WE KEPT THAT IN MIND WHEN WE INSTALLED THESE FIVE POINT HARNESSES FROM SUMMIT RACING. HAMMER ON IT CAUSE THAT'S HOW PEOPLE GET HURT. SO WE'RE JUST GONNA TAKE IT EASY AND SEE WHAT IT DOES. LOOKS LIKE WE'RE BURNING A LITTLE BIT OF OIL SOMEWHERE. WE BETTER TAKE A LOOK AT IT. (TOMMY)>> WHAT I THINK IT IS IS I PUT A CUSHION CLAMP HOLDING THE CABLE BACK OUT OF THE WAY FROM MELTING IT AGAINST THE HEADER. IT MAY BE BLOWING OUT FROM THE OIL PAN THERE. I CAN'T GET ON IT. (RICK)>> WELL I'VE BEEN SHORT SHIFTING IT AND SHUTTING HER DOWN EARLY SO FAR. NOW I'D LIKE TO MAKE A FULL BLOWN PASS OR TWO BUT UNLESS WE CAN GET THAT OIL LEAK KNOCKED OUT, IT'S NOT GONNA HAPPEN. 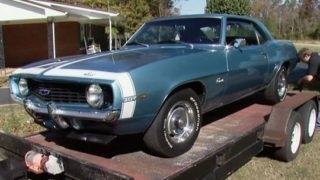 (TOMMY)>> I'M NOT REAL SURE IF WE GOT THE OIL FIXED ON IT, OR THE OIL LEAK ON IT, CAUSE IT'S STILL SMOKING QUITE A BIT. BUT I DON'T KNOW, IT MAY BE JUST THE HEADER BURNING ALL OF IT OFF. OF AN OIL LEAK COMING OUT FROM SOMEWHERE. WE CAN'T FIGURE OUT WHAT IT IS. WE THOUGHT IT WAS THE PAN. WE CINCHED IT DOWN, IT STILL BLEW OIL OUT THE BACK. WE'RE GONNA TRY TO DO ONE MORE PASS WITH IT. I GRABBED SECOND GEAR AND TRIED MATTING IT IN SECOND GEAR AND THAT'S WHEN IT WANTED TO NOSE OVER ON ITSELF. BY THE TIME IT CAUGHT I WAS ALREADY ALMOST AT THE TOP OF SECOND GEAR. I TRIED TO GRABBED THIRD AND THEN I WAS GOING OVER THE LIGHT. SO THERE'S SOME TUNING ISSUES. (TOMMY)>> YEAH, WITH THAT OIL LEAK TOO MAN, WE DON'T NEED TO BE TAKING A TRIP DOWN THE TRACK WITH IT CAUSE YOU KNOW, THAT'S GONNA CAUSE SOMEBODY GETTING HURT OR EVEN WORSE. YEAH, I GUESS WE BETTER LOAD IT UP, GET IT BACK TO SHOP, GET IT DIALED IN A LITTLE BETTER AND MAYBE WE'LL COME OUT AGAIN. (RICK)>> WELL WE FOUND OUR LEAK. APPARENTLY WHEN WE PUT IN THE OIL DIP STICK, WE GOT A LITTLE TOO AGGRESSIVE AND CRACKED THE BASE OF IT. BUILD UP A LITTLE BIT OF CRANK CASE PRESSURE AND ALL THAT OIL COMES THROUGH THE CRACK AND RIGHT ONTO THE EXHAUST. IT HAPPENS, AT LEAST IT'S AN EASY FIX. WELL HEY, IF YOU GUYS HAVE ANY QUESTIONS ABOUT ANYTHING ON THE SHOW TODAY, CHECK IT ALL OUT AT POWERBLOCK TV DOT COM. AND DON'T WORRY CAUSE THIS CAR WILL BE BACK ON THE TRACK JUST NOT TODAY CAUSE TODAY WE'RE OUT OF TIME. SO UNTIL NEXT TIME, WE'RE OUTTA HERE.